There’s a lot of us out there that are looking to get inked and there’s always the fear of the tattoo going wrong or if it will hurt too much or just getting plain cold feet. But Bangalore has a lot of reputed and trusted tattoo artistes who are very good at what they do and do not compromise on hygiene and sanitation either. So here’s our list of who you should go to, to get yourself inked. Skin Deep started way back in 2005 and is one of Bangalore’s most famous and largest tattoo studios. Located in Indiranagar, the studio houses over ten artists and does tattoos and piercings. The works can range from portraits to greyscale and they even do coverups for tattoos if you aren’t happy with your previous tattoos. They charge by the square inch, and it sets you back only INR 700 per square inch. But they do have increased rates for larger tattoos, which you can find out after consultation with them. Tattoo artistes Sudarshan, Senthil and Madan will work their magic on you. One of Bangalore’s and India’s oldest tattoo studios, Bramha Tattoo Studio is well known throughout the country. Bramha Tattoo Studio opened in 2004, making it Bangalore’s first tattoo studio. They also have a system of painless tattoos, using anaesthetics to numb the area, so the process causes no pain whatsoever. And the design choices are endless. You could pick anything, and they will do it for you. They have a base rate of around INR 4,600 which is a bit steep, compared to the others. They also offer vitiligo cure and treatment facility. Ask for Girish when you head here. Charging only INR 500 per square inch, which is reasonably cheaper than other studios across the city but that does not mean that these guys don’t make some badass tattoos. They do tattoos and piercings, and the designs are endless, depending on your choice and your budget as well. They have two tattoo studios, one in Jayanagar and the other in Basavanagudi. Tattoos are painless, they are hygienic and all safety standards are followed. They even have a tattoo training course, for all you budding artists out there. Larger tattoos are priced on the basis of size on each. The Dark Arts Tattoo Studio opened in 2003 and was founded by Pradeep Menon. It originally specialised in Celtic and Tribal tattoos but since have diversified and now do tattoos of all types and designs. Located in Koramangala, the studio also does piercings with the help of an in-house doctor — Padmanabha. You can get tattoos of any design and colour. Prices start at INR 4,000 and you get a post care kit after your tattoo. They follow all health and safety regulations and have the latest equipment. Mykel Kumar from the Pumpkin Patch is so famous, he’s got fans everywhere, even Kanchipuram! The studio is in Kalyan Nagar and you can give Mykel any picture, even one off the internet and it will be on your body in no time. The tattoo equipment is well sanitised and is up to date. All his tattoos are done with precision and care and his faithfuls swear by him. Didn’t include your favourite tattoo artiste? Tell us in comments. Yakshini is one of the few artists in India who practice traditional handpoke tattoos. Made with healing methods, using medicinal plants and herbal inks, her tattoos channel people's life experiences into symbols that are transformative for them. You should also check out her tattoo aftercare salve, Dr. Sood - it has no preservatives, dyes or scents and is completely natural. If you want to book an appointment to get a tattoo done, or want to order the tattoo balm, just reach out to her on Instagram. While the artists in Sculp all have different design styles, they do have a penchant for nature-based design. And if you're looking for a sleeve tattoo, this is just the place for you. Each design is unique and incorporates a bit of your vibe. What's more, the store is well lit, with art on the walls and succulents to keep you calm, so your tattooing session will go smoothly. Located on the residential side of Indiranagar 7th Main, Irezumi specialises in custom tattoo art and body piercings. Plus, they also teach you the art of tattooing from scratch! The man behind the studio, Naveen specialises in Japanese, tribal, abstract and geometric designs. 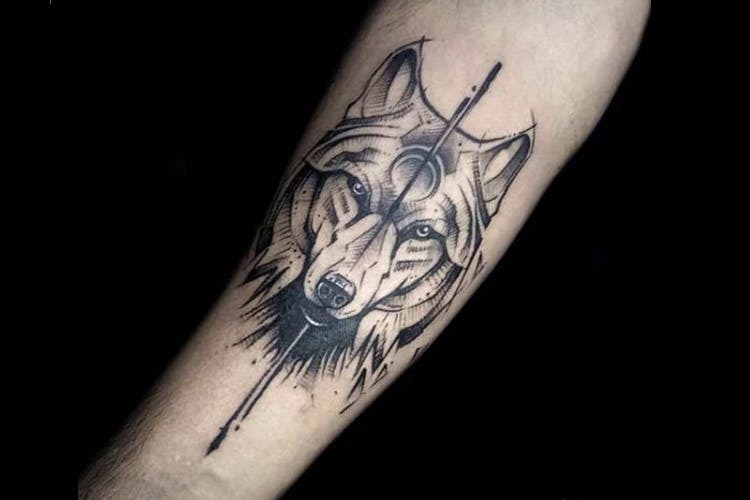 We love that the studio does animal designs combined with abstracts, but our favourites are their pop culture tattoos (think The Joker and Lion King!). As an independent tattoo artist, Thapan's expertise is in understanding and re-creating the design you have in mind. His speciality lies in arm sleeves, and his designs range from abstract to geometric, freehand to dotwork, portraits to Mandalas, or a combination of all of the above! The only way to reach out to him is through his Instagram page, so go through his work there and DM him for more details about his studio and appointments.